Harman-Kardon BDS 477 review | What Hi-Fi? 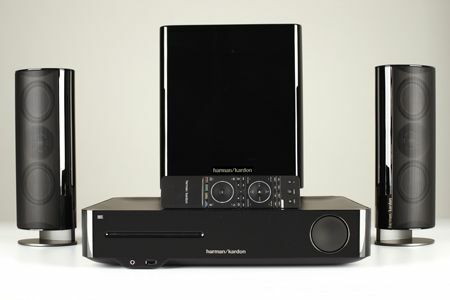 Harman Kardon has recently launched a new range of home cinema systems in its BDS series, and for those wanting an all-in-one solution for their home entertainment, this HK BDS 477 2.1 system just might be the thing. With 3D Blu-ray playback, Bluetooth streaming, Apple AirPlay compatibility, wi-fi and HDMI connectivity, there's plenty for the BDS 477 to boast about. From your DVD and CD collection or the latest 3D Blu-rays, to online media and various playlists stored on your smartphone or tablet, this system aims to play it all. We start by playing the Blu-ray of The Dark Knight, a test favourite. With video, the BDS 477 is quite a capable device. The colours are dynamic and vivid, with a contrast that shows off deep blacks with punchy highlights. The picture is clear and has good detail, but we'd have liked some more subtlety and smoother motion for it to be a true contender among the leading players from the likes of Sony and Panasonic. With that impressive price tag, we're bound to have high expectations. Out of the box, the BDS 477 is dressed all in black, with the main unit accompanied by two well-built satellites and a glossy subwoofer. The satellites have dual flat-panel midrange drivers with a dome tweeter nestled under the grille, and 65W powering each channel. The compact yet weighty subwoofer contains a downward-firing 20cm driver with an equally weighty 200W of amplification. The satellites and subwoofer integrate well, working together in time to deliver a dynamic and cohesive sound. The high-end is just shy of a shimmer, giving an edge to the tension-filled soundtrack whenever the Joker enters the scene. As things escalate, with Batman throwing punches left, right and centre, there’s good weight and strength behind the impacts. Crashes and explosions are met with equal aplomb, although that subwoofer could go deeper to fully explore the depths of Hans Zimmer’s soundtrack. Where things to start to falter is with dialogue, with voices sounding slightly muffled and rounded. This smoothed-out sound permeates throughout the film, robbing gunshots of their hard-hitting edges, for example. While the BDS 477 is a good-sounding system that’s easy on the ears, it doesn’t have the outright clarity and transparency to match the best products at this price. Much as with its picture quality, the BDS 477’s sound lacks those layers of refinement and subtlety that would make this system stand out from its rivals. As it stands, it can’t quite live up to its £1100 price tag. Switch to wireless streaming, and it’s a similar story. If you’re looking for multiple streaming options for various sources, you’re in luck: along with Apple AirPlay and Harman’s own TrueStream Bluetooth, you can access your stored media via USB and over your home network. Play Amanda Palmer’s Theatre is Evil, and it’s an upbeat and entertaining listen that almost -– but not quite – reveals the aggression and raw emotion in her vocals. Harman Kardon BDS 477: VerdictThe BDS 477 system itself is lovely to use with a rather stylish remote, and the comprehensive specification impresses. In terms of outright performance, it remains competent and pleasantly enjoyable, but lacks the verve and transparency to give us something to marvel at. It’s worth an audition for the features alone, but for us, it’s not enough to justify the price or a fifth star.